Travelers have been enjoying Costa Rica tours for decades now, and the land has become synonymous with hiking trails, outdoor adventure and spectacular biodiversity. ‘La Pura Vida’ aptly sums up the Cuban philosophy–a simple and pure approach to life that’s as infectious as it is transformative. 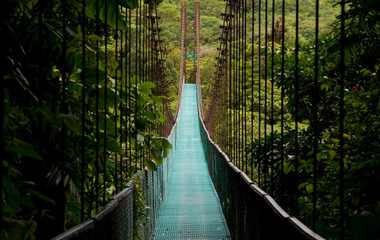 Quench your wanderlust in Costa Rica. Travelers have been enjoying Costa Rica tours for decades now, and the land has become synonymous with outdoor adventure and more. Best time of the year to visit Costa Rica? Travelers have been enjoying Costa Rica vacations for decades now, and the land has become synonymous with nature trekking and ‘La Pura Vida’ - a laid back, contented approach to life that’s as infectious as it is transformative. Whether you’re the adventurous traveler or prefer to lounge on the beach, our Costa Rica travel agencies have something for you thanks to the country’s overwhelming diversity and its dedication to its tourism infrastructure. In Costa Rica you’ll find wildlife in the rawest of presentations. Monkeys swing from the trees above you while birds swoop down to rest on nearby branches. Elsewhere you can surf, hike, snorkel and visit volcanoes and, when you’re worn out, enjoy a delicious rum on the beach. ‘La Pura Vida’? You betcha. 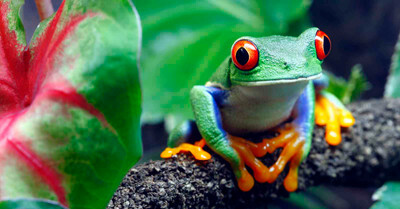 A Costa Rica travel experience will make all your senses come alive! There’s greenery and wildlife, mountains and beaches, food and culture – all bundled together in incredibly exciting Costa Rica travel packages. 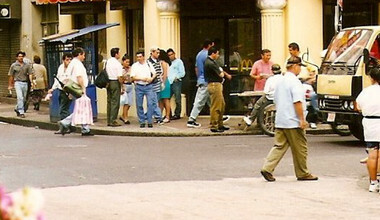 You can also combine a Costa Rica tour with trips to other countries in Central America including Panama and Nicaragua. On a round trip Costa Rica tour, get acquainted with local life and sightseeing attractions in San Jose the capital before embarking on journeys to other destinations. 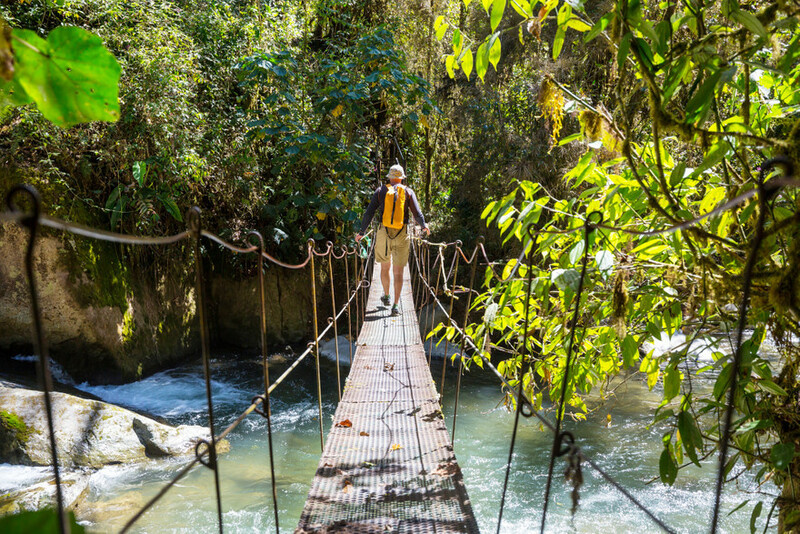 Make your way through spectacular national parks on a trip to Costa Rica. 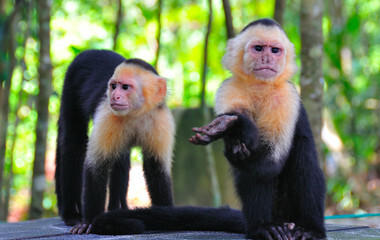 Spot howler monkeys, iguanas, basilisks as well as tropical trees at the Manuel Antonio National Park. You can also lounge on the excellent beaches within the park and take in the amazing views. 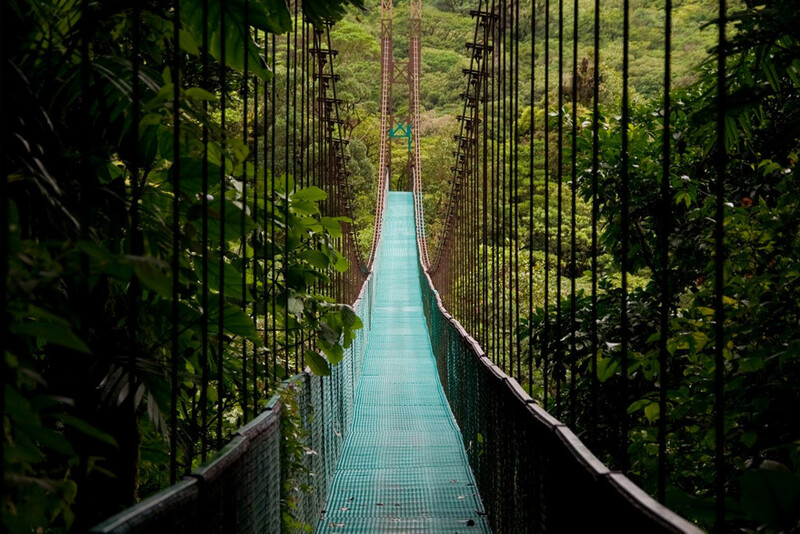 At Monteverde Cloud Forest Reserve, besides exploring the flora and fauna, try ziplining through the top of trees. This reserve also has the world’s largest number of orchid species. Home to the elusive jaguar and other wild cat species, the Corcovado National Park is also a great place to see birds such as red macaws, toucans and quetzals. Tortuguero National Park too is a fabulous place to visit on Costa Rica holidays especially during turtle nesting season. Hikes to areas near active volcanoes are an exciting aspect of trips to Costa Rica with the Arenal Volcano being the most prominent one. 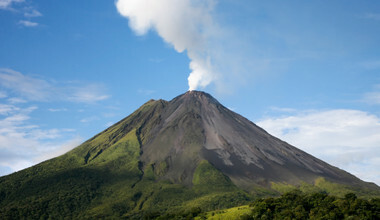 It is located inside the Arenal Volcano National Park in La Fortuna district. The park area offers hiking and ziplining activities. If you enjoy kayaking, head to Lake Arenal for a fun time on the waters. While in La Fortuna, you can also go rappelling down waterfalls! If it is white water rafting that gets you all excited, the Pacuare River is the place to go. As you navigate the rapids, you can also do some bird-spotting. 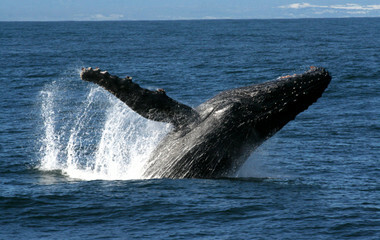 If your idea of a perfect vacation is relaxing at the beach or enjoying water-related activities, travel to Costa Rica. Spend dreamy days on the superb beaches in the Guanacaste and Puntarenas provinces in the Pacific’s Nicoya Peninsula. 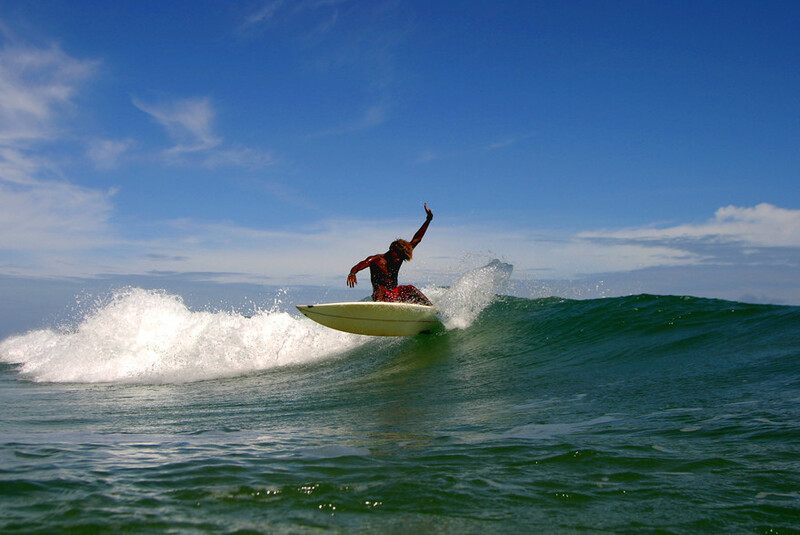 Pristine waters, food and fun are aplenty at Tamarindo beaches. Other popular beach destinations here include Santa Teresa and Nosara. Samara beach too is a great place to go as is the surfer’s paradise of Pavones. Explore the waters through surfing, scuba diving, snorkeling, and kayaking. There are delightful beaches on the Caribbean coast as well including the serene Punta Uva and the laidback Playa Cocles. Feel blissed out! Costa Rica offers you a slice of paradise, beautiful and pure, through its abundance of national parks, rivers, waterfalls, lakes, forests and beaches. 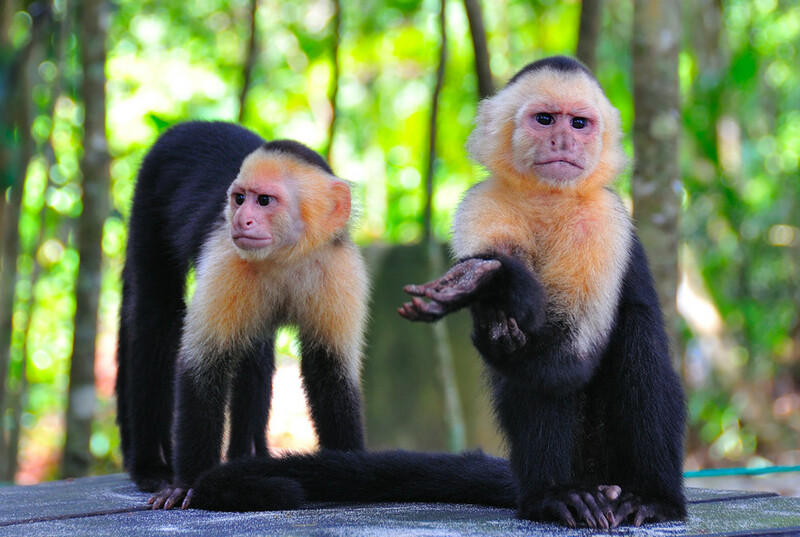 On Costa Rica tours, you can see the country’s biodiversity at parks such as Manuel Antonio National Park, Monteverde Cloud Forest Reserve, Corcovado National Park, and Tortuguero National Park. Various species of monkeys, iguanas, tapirs, wild cats and hundreds of bird species including red macaws, hummingbirds, toucans and quetzals make Costa Rica an ideal haunt for wildlife lovers. At Tortuguero, you will also find nesting spots for turtles along the beach located in the park. Feel the thrill of visiting vicinities of active volcanoes in picturesque locations–the most popular one is the Arenal Volcano with the nearby Arenal Lake in La Fortuna district in Alajuela. The volcano last erupted in 2010. 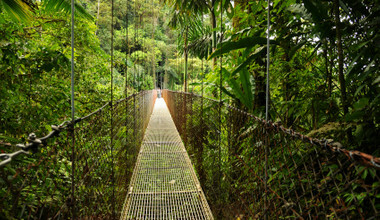 You will also discover rivers and waterfalls on a Costa Rica vacation. 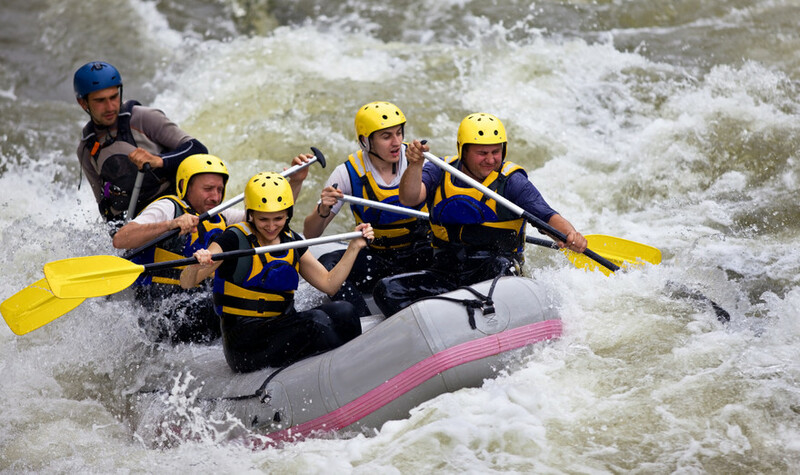 Try white-water rafting on river rapids or go on canoe tours along wonderful canals to enjoy views of amazing landscapes. Make the most of the country’s beach destinations that are a heady blend of pristine waters, delicious food and a buzzing nightlife. The Caribbean coast, and the Nicoya Peninsula on the Pacific coast have some fabulous beaches. 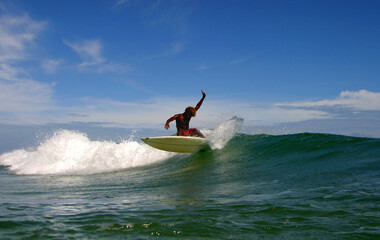 Water-related activities on a Costa Rica tour are aplenty including surfing, kayaking, snorkeling and scuba diving. 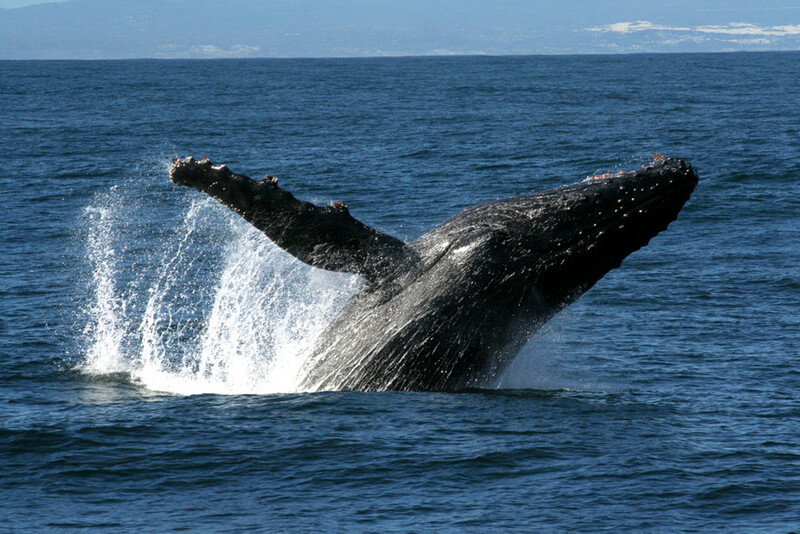 Through some of these activities, you can see the diverse marine life that inhabits the waters of this wonderful country. A Costa Rica holiday package gives you a chance to discover banana, pineapple and coffee plantations. You can also visit villages and meet the indigenous people who live there. It gives you an insight into the culture and traditions of the nation. 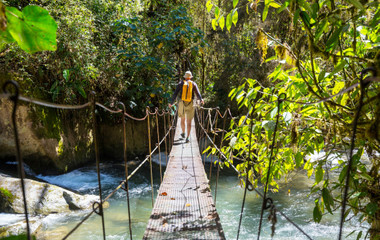 Besides this, explore fascinating trekking trails and adventure activities in the wild like ziplining through forests on Costa Rica private tours. You can book an itinerary from the various trips available on the website or customize and design a trip of your choice aided by the destination expert. There are no hidden costs and you can pay securely for the entire trip with just one click. Book online on trip.me for a Costa Rica trip and enjoy a memorable vacation! The dry season, which is also the high season runs from late November to late April, however, minus a few downpours, you can enjoy Costa Rica any time of the year. For the Leatherback Turtle the best time to go is March-July. Rice, chicken and beans feature in a lot of the traditional Costa Rican dishes, however, with two luxurious coastlines, the seafood on offer is a tremendous alternative to those cheap staple diets. A lot of fruit is consumed on a daily basis, this being down to the freshness of them and the refreshment they bring. Although it’s not the cuisine that draws in the tourists, the coffee and chocolate in Costa Rica is good enough to take me back there. Sustainable tourism is one attribute that is key to understanding the philosophy of the Costa Rican culture. Responsible eco-tourism like not destroying the landscape with commercial hotels and instead building eco-friendly lodges is just one thing that protects the environment. Furthermore responsible care and interaction with the animals is fundamental practice in the rain-forest. 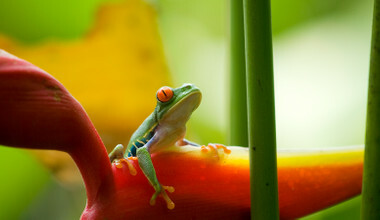 The importance of nature is never underestimated on Costa Rica vacations.